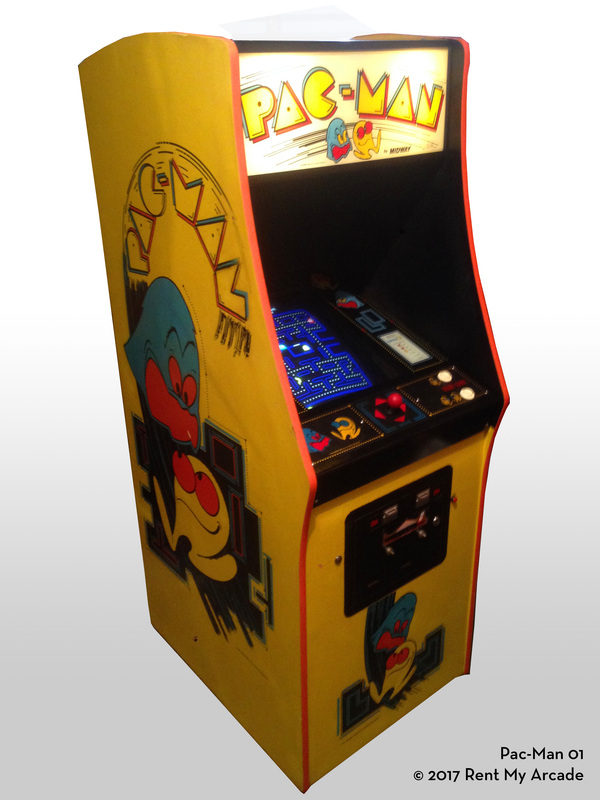 Pac-Man: A sensational, full color video game for 1 or 2 players that tickles vision and challenges reflexes. Adding to the fun are musical refrains, chomping and action sounds along with amusing cartoon shows between racks. The player, using a single handle control, guides the Pac-Man about the maze, scoring points by munching up the Dots in his path. Four Ghost Monsters - Inky, Blinky, Pinky and Clyde - chase after the Pac-Man trying to capture and deflate him. The Pac-Man can counterattack by eating the big, Power Capsule that enables him to overpower the Monsters for additional score. After all the Dots are gobbled up, the screen is cleared, and the Pac-Man continues for another round. Each rack features a special Fruit Target in the maze, which if eaten, earns Bonus Points. Players start with three Pac-Men. An additional Pac-Man is awarded for 10,000 points.